International Labour Network of Solidarity and Struggles express solidarity with the comrades of the Committee of former militants of the General Union of Tunisian Students (UGET) on hunger strike since December 17, 2015, and currently occupying the premises of UGET. These comrades were part of the "Jasmine Revolution" that ousted dictator Ben Ali at the end of 2010. In this period, according to Human Rights Watch, students and trade unionists have been the most affected by government repression. 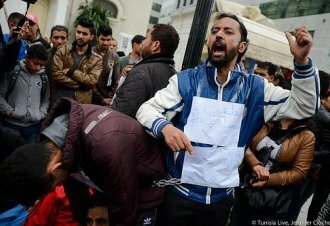 These activists are graduates, teachers, doctors, but suffering with unemployment and even the prevention of taking positions conquered via public tenders for the public education system in Tunisia. This restriction is political and militant on strikes are marked on a blacklist of the country, even after the end of the dictatorship of Ben Ali.